SOUTH STREET (WPVI) -- People gathered Sunday night to remember a man who was shot and killed outside a concert on South Street. 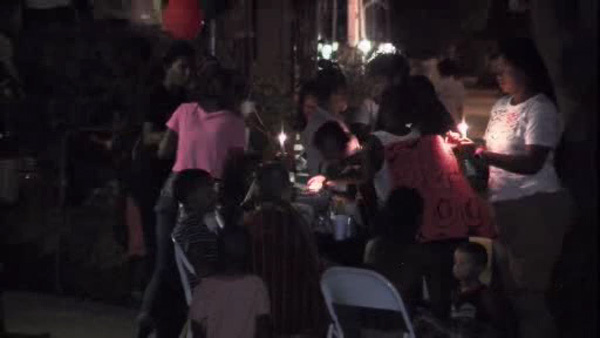 The vigil for 25-year-old John Green was held at Dyre Street in Frankford. Green was killed outside the Theater of the Living Arts on the 300 block of South Street just after 8:00 p.m. Friday night. There was a concert going on inside at the time. An Action News viewer recorded video outside the TLA in the moments following the shooting. Green was shot at least one time in the abdomen. He was transported to Hahnemann University Hospital where he was pronounced dead. Police say there were a lot of people on South Street when the shooting took place. They're asking anyone with information to come forward. Arrest made in shooting death outside TLA on South St.